Most people have one thing that makes them relax and rejuvenates them from the daily stresses of life. For some, it's a place. For some it's an activity. For me, it's saddle time. Horses are a lot of work to take care of every day, whether you ride or not. With the demands of a full time job and the chores that come with our homesteader lifestyle, finding time to just have fun can be a challenge. Most of the big chores have to be done on the weekend and somehow the To Do List always ends with more things than can be accomplished in one weekend. So you learn to prioritize. You learn to pick ONE THING that has to happen on any given weekend. When it's done, you do as many of the other things on the list as time allows. Having things still left on the list at the end of the weekend just means next weekend's list is already started. Yeoldfurt works on Sundays, so that's generally my day for housework. Domestic drudgery like laundry and scrubbing floors. Those things that are hardly ever noticed ...unless they're not done. But I try to accomplish at least one non-housework project every Sunday too. Today it was riding. I had not been on my horse since the grandsons were here in July. It was too hot most of July and August and I have been out of town for two weekends in September already. But the mornings lately have been downright pleasant and the evenings are starting to get bearable. So I was up before the sun this morning and was saddled up as soon as it was light outside. I was only in the saddle for an hour, only rode in the round pen and the front paddock, but it sure felt good. When we were done, I let my mare 'mow' the grass in the chicken yard for an hour before I turned her out with the others. There are four fruit trees that we keep watered in the chicken yard so it's the place we have any grass right now. My mare enjoyed it. That hour I spent in the saddle must have done me good because I've accomplished everything I normally accomplish on Sundays and then some. The sheets are changed on the bed, the laundry is washed, dried, folded and put away, the bathrooms have been scrubbed and the rugs are washed and hanging outside to dry. I also made a batch of liquid laundry soap (four months worth) and raked the leaves in one of the four flower beds. The horse blankets we cleaned up last week are folded and bagged up to be stored until cold weather comes. Yeoldfurt's dinner is in the oven (slow roasted pork ribs) and I have five pints of homemade split pea soup processing on the stove. Yeoldfurt won't eat it, but I was cleaning out cupboards and found a pound of dried split peas I needed to use up. In pint jars, it's just enough for me for supper on a cold winter day with enough left over to take to work for lunch the next day. So even though I took an hour to just play with my horse this morning, I got a lot accomplished today. Yup, for me, it's saddle time! On December 31st last year, I posted a list of goals for myself for the coming year ...a few things I wanted to accumulate or accomplish, and a few new skills I wanted to acquire. Now with a little over three months left in the year, I look back at that list and think I had better pick up my pace if I want to be able to check everything off at the end of this year. First on my list were the Challenge Goals ...those things that I hoped to accomplish, believed I could accomplish, but knew I would have to dog myself to get them done. I would say I'm at about 50 percent on that list. That's kind of disappointing when you consider there were only three items on that list ...purging some of the stuff that is just laying around and not being useful to anybody, organizing our food storage, and minimizing ME ...as in dropping some weight. Purging might be one of those things like housework that never really gets DONE. You have to do a certain amount of it on a regular basis and do a whole lot of it once in a while, but you never really get done. I've made serious progress though. In general, there's a lot less 'stuff' laying around and, in the process of sorting and purging, I now have a much better idea of what's actually here. That's the big bonus! On getting organized in the food storage, I have to say we have exceeded the expectations I had when we set the goal. Yeoldfurt built me some shelving, I bought some new storage containers, we've improved the methods of labeling we use and streamlined our process for maintaining the inventory spreadsheet. I'm now much more confident in the amount we have stored, how long it would last us and the accuracy of our record-keeping. We've made a lot of improvement in organization this year. As for the goal of minimizing ME, I didn't set a specific goal weight but I'm halfway to where I'd like to be. I wish I could say I am all the way there now ...but halfway is encouraging. It's enough of a difference that people who haven't seen me in a while notice, and enough that I can feel the difference in the clothes I wear. Best of all, my ankle bothers me much less these days ...less often and less severely when it does. The second part of my list was the Standard Goals ...those things that pretty much stay on the list year after year in one form or another because we are preppers. It's more than a philosophy, it's a lifestyle. There were five items on the list of Standard Goals ...Reconfiguring the raised bed, Improving the chicken coop, Debt elimination, Increasing our supply of non-food items, and learning New Skills. I am pleased to say we can check that first item off the list. Yeoldfurt single-handedly reconfigured our 16x16 raised bed garden into several smaller beds. He accomplished that goal on a couple of Tuesdays when he was off and I was at work and he did a great job. He even built me a deluxe compost bin conveniently located just a few feet from the raised beds. He is making plans and scavenging lumber to add additional beds and I'm making plans for some cold frames to set over the smaller beds and hopefully lengthen our growing season. One thing always leads to another! He has also made some real improvements to the chicken coop, building new nest boxes and further snake-proofing the structure. I still want to build an off the ground brood box in the smaller room but there is no rush since we only buy new chicks every other year and the next time we will need a brood box will be 2013. Debt elimination is another one of those almost never done goals. We still have no debt other than our mortgage and make additional payments on the principle every month, but we're a long way from paying off the mortgage. We did speak to a locally owned bank about refinancing a few months ago, but the interest rate they offered was only one-quarter percent lower than we have now and they would only consider a fifteen year note ...our monthly obligation would have increased by nearly 40 percent. The amount of the payment on their terms would have been equal to what we normally pay, so certainly feasible. But the amount we pay now includes our additional payment toward the principle and if we have a tight month, we always have the option of paying only the amount due. We didn't think refinancing made sense on those terms. But we have made significant progress in eliminating our mortgage so I consider that goal met as well. Yeoldfurt has had fun with the next goal on that list which was increasing our nonfood supplies. He has acquired some additional ammunition as well as some of the tools he needs to do a lot more reloading of his own again. He used to do quite a bit of reloading and I think he's enjoying picking it up again ....kind of like me and sewing. We also accumulated a lot more in the way of canning supplies and a second (backup) Foodsaver. Finally, there are the new skills and knowledge we hoped to acquire. Specifically, I said that I wanted to learn to make shampoo, conditioner and body wash. I can't claim to have even investigated any of those processes, so I need to get busy in that regard. I know Humblewife makes all those things and many more useful things from scratch so that's probably where I will start my research. She is an amazing source of information and inspiration, but true to her blog name, she is also one of the most truly humble people I have the privilege of knowing. If you have not ever visited her blog, I hope you will do so. I'm going to go out on a limb here and say that I hope to learn to make dishwasher soap this year as well. As long as I am working a full time job and commuting two hours a day, I will be using a dishwasher so I will be using dishwasher soap. I might as well learn to make it. And finally, felling trees is the other 'new skill' I had hoped to acquire this year. We have about ten dead pines along the driveway and in the sideyard that need to come down but need to land a certain way in order to miss the fenceline or keep from blocking the driveway. I'm waiting for cooler weather to tackle that one though. So I set thirteen goals for myself, am somewhat lacking on two of them, and totally lacking on the last one. Not a horrible score, but nothing to brag about either. Guess I better pick up the pace! When I logged off the computer last Friday night, the weather forecast predicted a 20 to 40 percent chance of rain for four days, Sunday through Wednesday. I woke up to thunder and lightning and a soft steady rain on Sunday morning. The front paddock which is a high spot on our property had an inch or two of standing water on it. What a beautiful sight it was, a great way to start the day. Unfortunately, it didn't last long. By 9:00am, the rain had stopped, the sun was shining and temperatures were creeping up. I think the high on Sunday was only 90 degrees. It was hot, but not nearly as hot as we had become accustomed to these past few months. We only got half an inch according to the rain gauge. We are grateful but it's not nearly enough. 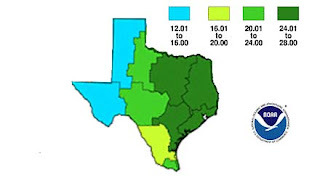 I ran across an interesting article on weather.com about what it would take for us to catch up on rainfall for this year. 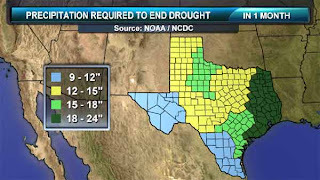 The first map below divides the state into four regions according to how severe the drought has been in that region. The legend indicates how many inches of rainfall each region would need to receive in just one month in order to recover from the drought. Where we live straddles the line between the yellow and light green regions on this map. So for us, it would take 12-18 inches of rainfall in a one month period to break even for the year. Like that's going to happen. What has made this situation even worse is that on top of the severe drought, we've had incredibly long stretches of 100+ temperatures. We lost a dozen trees since last year. These weren't young, barely established trees that were unaccustomed to or unsuited for this area either. They were mature oaks, pines and cedars. It's a sad thing to watch. But besides the devastation to local vegetation, wildfires like the ones we saw in Bastrop, Walker, Grimes, Waller and Robertson counties earlier this month are a constant threat. That's a list of just five major wildfires that were within 50 miles of our place. There were other wildfires all over the state at the same time. Resources are stretched very thin. According to this next map, we will need approximately 24 to 28 inches of rainfall in the next six months to end this drought. That's an average of over 4-1/2 inches per month. I don't think the odds are in our favor. No rain means no hay. No hay means ranchers cull their herds or sell out. Smaller herds mean less meat supply and eventually higher prices. If you can't grow hay, you can't grow any other crops either. Minimal crops mean less supply and higher prices on those things too. No, you can't control the weather. No one can. But pray for rain, people. Even if your livelihood is not somehow tied to the land, even if the only livestock you own are a cat and a dog, a drought this widespread and this severe impacts the entire economy. Pray for rain. I've had flower and vegetable gardens most of my adult life, so I'm not exactly a newbie when it comes to growing things. But I have never grown an avocado tree. There is a first time for everything though and thank goodness for the Internet where practically anything you want to research is right there at your fingertips! When I was on vacation last week, my friend, Teresa, gave me a tiny avocado seedling. She said it came from an avocado plucked from a tree on her brother's dairy farm in California. It was well started in rich potting soil when she gave it to me and seemed to be thriving. Teresa promised she would come up for a visit one day soon so I'm just hoping I can keep this little seedling happy and thriving at least until she gets up here! Yeoldfurt loves guacamole so it would be nice to be able to grow our own. But everything I've read so far says that trees started from seed produce rarely fruit. It seems the best fruit-producing avocado trees are grafted as seedlings. That's a very tedious process with only about a 50 percent success rate even for professional growers. So this little seedling, if it matures into a tree, will most likely just have to be appreciated for it's beauty and not so much it's fruit. If I am successful in growing it though, I might look into buying a grafted seedling so Yeoldfurt could have his home grown avocados. Any advice from those of you who have grown avocados from seed would be most welcome! so I guess maybe my first sewing project in 30 years came out okay! As you can see, they are already best of buds! I was gone for four days and three nights and Yeoldfurt did an outstanding job of taking care of himself and the homestead. He did a fine job today of spoiling me rotten too. This was his regular day off and my last day of vacation and we took full advantage of the opportunity to spend time together. We went into the Big City to pick up a few things he needed for his shop and he treated me to both lunch and dinner. Lunch was a sit down meal, but dinner tonight is a box of spicy fried chicken and dirty rice from Pop-eyes. If you have never had Pop-eyes chicken, you will just have to trust me ...it's good! will take care of painting the car and buy us that deep freeze we've been wanting. I did not know when I started this project quite how challenging this pattern would be or quite how rusty my sewing skills have become. It has been thirty-something years since I really did anything more complex than a hem. But perseverance won out in the end and I finished the project. 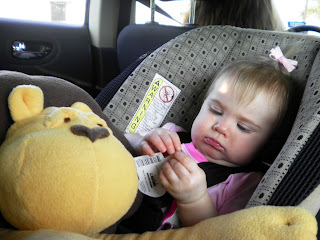 This is Keebler who I hope will end up being one of my little granddaughter's favorite cuddle buddies. My granddaughter may come up with her own name for him and whatever she wants to call him is fine with me. But he will always be KEEBLER to me. I will explain why later. The nose gave me fits from the beginning and I'm not sure I understand what I did to make it work well enough to explain. But I was finally able to fashion a nose out of the odd shaped bit of fabric and get it sewn in place so that it actually looks like a lion's nose. It even looks like the nose on the on the front of the pattern envelope. I would have settled for it just being recognizable as a nose. To have it end up looking like the one on the picture is unexpected bonus. I did have to deviate from the instructions quite a bit as they said to baste the nose in place on one side of the center of the muzzle and then stitch the two sides of the muzzle together with the nose sandwiched between them. I have a fairly nice sewing machine but it's not industrial strength. I was pretty sure it wouldn't be able to handle two layers of fleece (the two sides of the muzzle) plus four more layers of fleece made up by the folds in the nose. So I used the machine to make the seam up to the nose, then finished it by hand. I used heavy coat thread for the hand work, so hopefully it will hold up to the rigors of a toddler. Handwork is my comfort zone, so it was fun to include some of that. The day I finally conquered the nose, I also lost my head ...for a while anyway. I got the nose firmly attached to the muzzle and started looking for the pattern piece labeled 'head' ...but it was nowhere to be found. I always pin all the pattern pieces before I cut to make sure I will have enough fabric. Then I always cut all the pattern pieces at once and leave them pinned to their piece of the pattern until I'm ready for them. But I searched through all my cut pieces three times and NO HEAD. Each pattern piece has a number and the head was number four. I even took all the unused pattern pieces out of the envelope and made sure I had not just failed to cut that piece. But there was no number four in the envelope. Ugh! I knew the pattern company had not shorted me. Pattern pieces come all printed on one or two big sheets of tissue paper. You have to cut them apart to make individual pieces so you can arrange them on the fabric. I knew the missing pattern piece for the head had to be around here somewhere but I was running out of time to get this project done. I have my sewing machine setting on my grandmother's old writing desk which is tucked into a shallow alcove in my office. I thought the missing piece might have slipped off the desk while I was wrestling with the nose so I got out the flashlight and looked behind, under and on both sides of the desk. I didn't find it. I did find my cloth measuring tape though ...so the effort wasn't totally wasted. Frustrated and baffled, I went back to the instructions to see if I could improvise. This pattern has four variations ...a lion, a monkey, a dog, and a cat. The lion is the only one that calls for the number four pattern piece for the head. The other three variations have a similarly shaped head, with only a minor difference on one end. I figured that, in a pinch, I could substitute the pattern piece for the head that the other variations called for and just 'eyeball' the minor difference to make it work. My only concern was that though the two 'head' pieces might be shaped very similar, I would have no way of knowing until I tried to attach it to the muzzle if the scale was the same. But I was running out of options so I got set up to cut a 'head' from the other pattern piece. I have a 75 watt halogen bulb in a floor lamp beside the cutting table and wanted to turn it on so I could see better while I was cutting. I had to walk around to the back of the table to reach the switch on the floor lamp and as I stepped behind the table, I heard the familiar rustle of tissue paper. My missing pattern piece ...the number 4 head piece! It had apparently slipped off the table when I was laying the pieces out on the fabric. I didn't notice it was missing when I was cutting out the other pieces because there are 13 different pieces to this variation of the pattern and they are not consecutively numbered. The carpet in my office is circa 1985 which was smack dab in the middle of the 'earth tones' era in home decor. Typical of the 1980's, the carpet is a deep sculpture in a sandy tan, almost taupe color ...very similar in color to the pale tissue paper pattern piece. So I was able to cut the head from the correct piece of pattern after all. 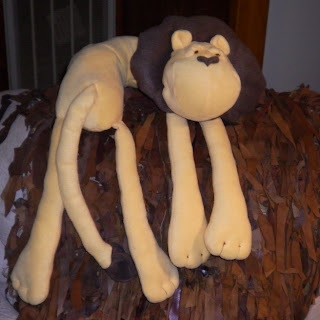 In retrospect, the only parts of this lion that I made by following the instructions exactly were the legs. I modified the tail to make the fuzzy end more 3-D and fashioned furrowed 'eyebrows' from remnant fabric rather than just embroidering them as the pattern suggested. I did embroider the eyes and used the same brown embroidery floss to fashion the toes on the end of his floppy legs. Thinking back on the process, he's about 50 percent 'by the book' and fifty percent me figuring a way to make it work or a way to make it work (look) better. And that brings us to the story of how he got his name. Well, fudge I did. First with the nose, then the tail, and almost had to fudge the entire head. I fudged on the assembly process, stitching by hand almost as much as on the machine. I even fudged to create a 'suspended' stiff interfacing in the mane so that I could stuff on both sides of the interfacing and it would feel soft all the way around, but would have an inner support that would keep it from being floppy. Yes, this lion is the product of a whole lot of fudging. Get it? Keebler Fudge? I know, I know ...I have a warped sense of humor. I am pleased at how he turned out and even more pleased that I got him finished with a whole day to spare before I leave for my weekend with my granddaughter. I work all day tomorrow but then I'm on vacation until next Wednesday. It will take me most of the morning Thursday to clean up my sewing room and turn it back into my office ... and the rest of the day to pack and put some meals in the freezer for Yeoldfurt to have while I'm gone. Assuming the threat of fires has lessened by Friday, I will leave early that morning and be back Monday before Yeoldfurt gets home from work. I will miss him but I'll make sure he has plenty of clean laundry and plenty of meals in the freezer until I get back. I'll have a nice supper ready for him when he gets home Monday evening and we'll be able to spend Tuesday together since that's his regular day off and I'll still be on vacation. By Tuesday, we will have been apart just long enough to miss each other's company and we can spend the day spoiling each other rotten. Life is good. Cute Little Devils, Aren't They? At least two of the four new hens are beginning to lay eggs now. When a hen first starts to lay, her eggs are smaller than they eventually will be ...possibly nature's way of easing her into called purpose in life. As she matures, her eggs will gradually get larger until they are full-sized. This is only our second batch of hens. We bought our first hens as day old chicks in 2009 and when they first started laying eggs, we had nothing except store-bought eggs to compare them to. So the size difference didn't seem that noticeable. One of those three hens lays HUGE eggs that will only comfortably fit into a Jumbo size egg carton. They will fit into a Large or Extra Large carton, but forget being able to close the lid. At least two of those three original hens are still laying, including Dora who lays the HUGE eggs. But production is way down, partly due to their age and partly due to this oppressive heat, I'm sure. This spring, we bought some new chicks. Hens don't lay eggs forever and we figured we needed to start phasing in replacements for the older birds. We started out with five Barred Rock chicks, but lost three to chicken snakes. It was the Last Supper for all but one of those chicken snakes. The third one was sporting a couple of 22 caliber holes when it slithered away ...hopefully it didn't survive the trauma. A few weeks later, we found a guy down the road that was selling some two month old Production Reds and we brought two of those home as well. Now we have seven chickens in the coop. That's really more than we need for eggs for just the two of us. It's also possibly more than we want unless we pick up a couple more egg customers. We're not really (and don't want to be) officially in the egg business. But for now, the seven hens are producing three to four eggs per day. Since the new hens are so young and have only been laying for a week or two, their eggs are still really small. I used a carton marked 'Grade A Large' because it was the biggest I happened to have on hand today. The HUGE eggs that Dora lays barely fit into a carton marked Jumbo. If I put what I refer to as our 'normal' eggs from our other two mature hens in a carton marked Extra Large, I can close the lid but it's tight. They will fit into a carton marked Large, but forget closing the lid. All this is for reference so you know what you're looking at here. I put six of the little bitty eggs in one side and six of the normal eggs on the other side. I laid two of the HUGE eggs and two more of the little bitty eggs on the open lid as a visual reference for size. Aren't the little bitty eggs cute?! Sweet red bell peppers were on sale for 50 cents each at the grocery store last week so I bought six. We love bell peppers. Sometimes I stuff them and sometimes I slice them up to steam with kielbasa or grilled chicken tenders. I bought six peppers and made stuffed peppers that night. I make the filling with one pound of ground beef, one egg for binder, about 1/3 cup fine seasoned bread crumbs, some spices and a bit of tomato sauce. The one pound of ground beef is enough to generously stuff six halved bell peppers. I slice them the long way and Yeoldfurt eats two halves for his supper and takes two halves for his lunch the next day. I eat half a pepper for supper and take the other half for my lunch the next day. Normally when I make these, I use one of the normal sized eggs. That time, I used two of the little bitty eggs. I was curious to see the quality of the egg itself since it was so tiny. But they were excellent quality. The yolks were dark yellow and, if anything, disproportionately larger than the whites. The two little eggs were perfect to replace the one normal sized egg I usually used to make this recipe. Tonight we're having a chef salad for dinner and I decided to make some deviled eggs to go with it. I usually use two of the HUGE eggs when I make deviled eggs but decided today to use the little bitty eggs. Now who would have thought you could fit a dozen deviled eggs on one 6-inch dessert plate? Tell me these aren't the cutest 'little devils' you've ever seen!